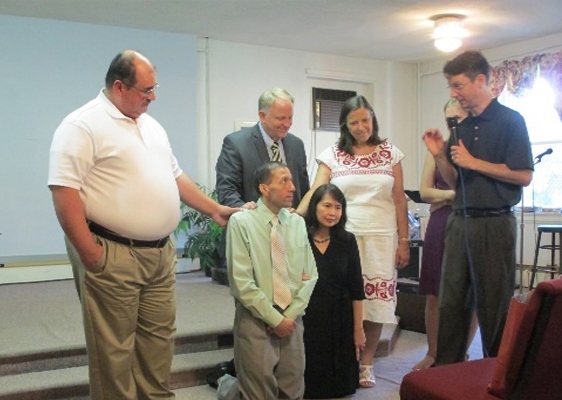 On August 2, 2015, I had the privilege and honor of officiating at the ordination service of Campo Ubaldo Rodriguez at Iglesia Nueva Esperanza that meets at Wilkens Avenue Mennonite Church located in Baltimore, Maryland. Ubaldo Rodriguez, originally from Colombia, educated at Eastern Mennonite Seminary, who is now serving with SEND International in Manila, the Philippines returned home for his ordination as he continues to build bridges between cultures and continents. Iglesia Nueva Esperanza is a church plant initiative of Pastor Kirk Hanger. Pastor Kirk is the pastor of New Hope Fellowship in Alexandria, VA a partner congregation with Franconia Mennonite Church. Pastor Kirk has been a mentor to Ubaldo over the years, as Ubaldo began pastoring at Iglesia Nueva Esperanza in 2011 and did so there for 2 years before moving to the Philippines, the home country of his wife, Joy, as a missionary with SEND International. Following Ubaldo’s ordination, I had the opportunity to ask both Ubaldo as well as Kirk Hanger, mentor to Ubaldo, a few questions about embracing God’s call and life in the Philippines. What has this ordination meant for you? Ubaldo: The recognition of my calling and ministry by the Franconia Conference gives me encouragement and I feel the support of the Mennonite community even though I am in the Philippines. Ubaldo, what is it you and Joy do in the Philippines? Ubaldo: We promote missions awareness, training Filipino missionaries to send others into the world to reach those who have never heard of Jesus and the Good News. We help churches to fulfill the Great Commission by doing missions training for them. We intentionally disciple people for them to disciple others (2 Timothy 2:2). Ubaldo: SEND is an international mission organization based in Michigan that sends missionaries to do church planting among the least reached peoples in about 20 countries. Currently, SEND has about 550 missionaries in the world. What brings you the greatest joy?Ubaldo: It brings me great joy to see people come to Christ and see their transformation as disciples for the Kingdom of God. Kirk, what has been your relationship with Ubaldo over the years? Kirk: I first met Ubaldo at a Church Planter’s Retreat at Highland Retreat in Virginia some years ago as he was finishing his studies at Eastern Mennonite Seminary. We later met at the Atlantic Northeast Conferences (ANEC) Regional Church planters gathering. Soon after that, Ubaldo called me to see if I might have a place where he could serve. At that point, I was looking for someone to lead Nueva Esperanza in Baltimore meeting at Wilkens Avenue Mennonite Church. Ubaldo came and pastored the church for about two years. I’ve been a mentor and pastor to Ubaldo since then. I had the opportunity to travel to the Philippines two years ago to preach at Ubaldo and Joy’s wedding. What have you appreciated about Ubaldo? Kirk: Ubaldo is a man of deep faith, humility and integrity. Ubaldo is a prayer warrior and spends much time in intercession. I appreciate his intercession for me, especially when I travel. His is also a gifted pastor and teacher and now along with Joy is making the church more aware of the importance of reaching the least reached in the world and mobilizing people for missions. 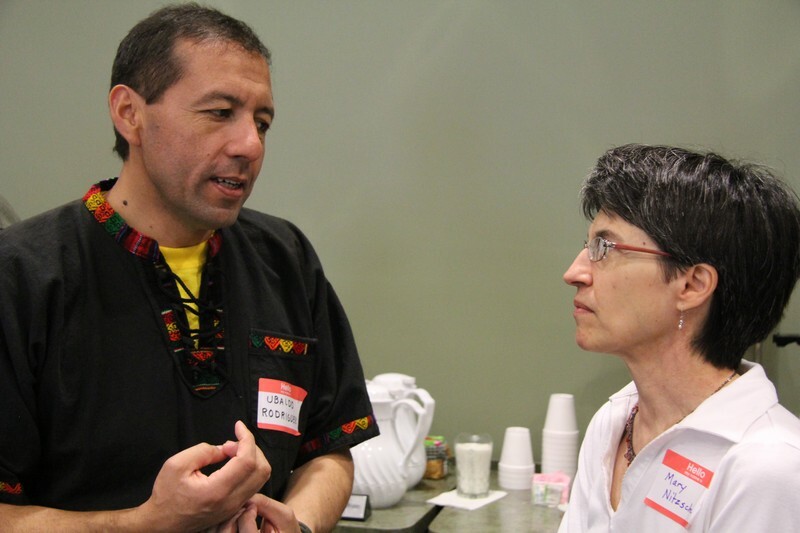 What has the partnership between Nueva Esperanza and Wilkens Avenue Mennonite Church been like? Kirk: Wilkens Avenue Mennonite Church is part of Lancaster Mennonite Conference. While Nueva Esperanza has grown out of New Hope Fellowship in Alexandria and through me connects with Franconia Conference, Wilkens Avenue shares the vision of a Spanish speaking church in the community. Wilkens Avenue provides a free space for the church to meet and occasional financial support for Nueva Esperanza. A couple of times a year Wilkens Avenue and Nueva Esperanza have a joint, bilingual outdoor evangelistic service. When Ubaldo lived in Baltimore, he related closely to the Wilkens Avenue congregation. 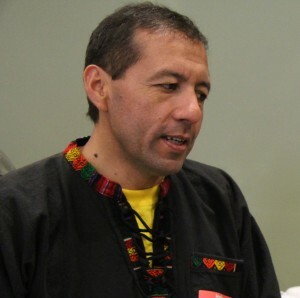 Ubaldo has bridged cultures and conferences, he has also play a role in RIMI (Red de Iglesias Misioneras Internacional/International Network of Missionary Churches), what will his ongoing relationship be with RIMI and you? Kirk: RIMI is a network of churches in eight countries that work together in church multiplication, leadership development and missionary mobilization. 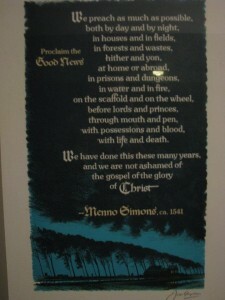 Ubaldo was instrumental in helping RIMI expand in South America. He and I visited his home church in Bogota, Columbia where I met Ubaldo’s pastor, Islandes and the co-pastor Eduardo. That visit began their relationship with RIMI. Recently, Pastor Eduardo was sent out to start a daughter church in Bogota and last year they hosted Generacion Sana / Healthy Generation, RIMI’s annual international youth event. Ubaldo also helped RIMI expand into Quito, Ecuador. Pastor Dairo Rubio had been pastor of Ubaldo’s church before Pastor Islandes many years ago. Pastor Dairo went to Quito to work with Trans-World Radio and while there started two churches. Dairo stays in close contact with the church in Colombia. Through Ubaldo, we met Dairo and he is now part of RIMI. Dairo is an excellent teacher and his experience in radio has helped RIMI’s radio ministry in Mexico expand. RIMI has an international network of intercessors and Ubaldo is one of the intercessors of the network. RIMI has a coordinator in Mexico who sends out prayer requests to intercessors in several countries who together pray for needs from around the globe. Ubaldo, Joy and I are developing a plan for young adults from Latin American to go to the Philippines to learn English and be equipped in the region for missions in Southeast Asia and beyond. We have people in Latin America interested in going and are praying for funding for this project. The goal is that some would commit to long term missions among the least reached. It seems that God’s purposes for Ubaldo and I meeting were much larger than Baltimore as Ubaldo has helped make important connections with Colombia, Ecuador and now South East Asia that we pray will result in the multiplication and training of many followers of Jesus. Franconia Mennonite Conference is delighted to have Ubaldo as one of our credentialed leaders as he continues to connect the body of Christ across cutlutres and continents. For more information or to send words of encouragement you can reach Ubaldo at: ubaldor@pscsend.org. To support Ubaldo and Joy’s ministry you can send checks payable to SEND International at this mailing address: 36216 Freedom Road, Farmington, MI USA 48332, or setup direct deposit by calling 800-SEND808 or 1-248-4774210. Ubaldo Rodriguez, left, is the newest member of the Ministerial Committee. The Ministerial Committee met on September 5 and November 7. At our September meeting, we welcomed Ubaldo Rodriguez as a new member of the committee. We took action to approve Kristopher Wint, associate pastor of Finland congregation, for a two-year ministerial license toward ordination and accepted the ordination credentials of John Stoltzfus, conference youth minister and campus pastor at Christopher Dock Mennonite High School, from Illinois Conference. At our November meeting, we approved Franco Salvatori, pastor of Rocky Ridge congregation, for a license toward ordination. 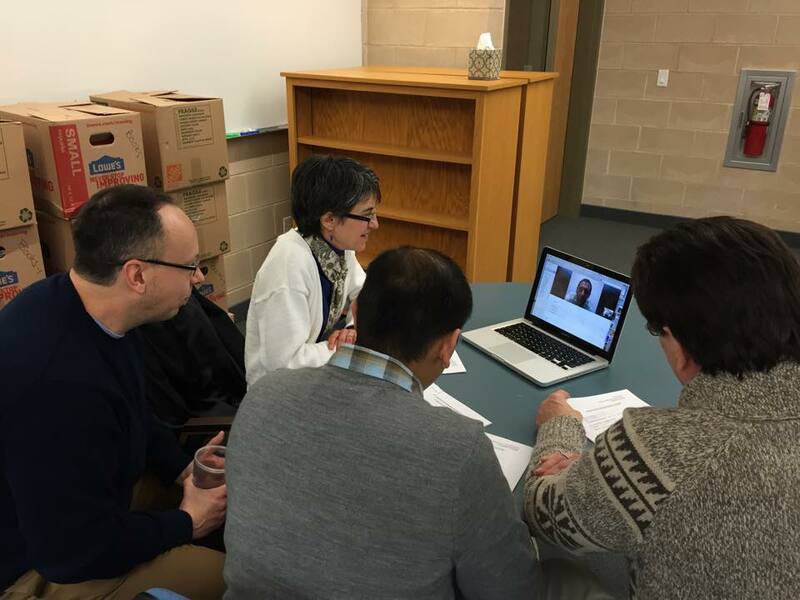 The committee took action to change the ordination status of Dennis Detweiler and Bill Brunk from “active’ to “retired.” The policy to assist credentialed leaders with counseling expenses was reviewed and updated. We invited LEADership Ministers and the Credentials Committee to join us in reviewing the policies that guide who we credential. I am glad that the Lord called me when I was a teenager. I believe nowadays that listening to God’s call is hard because we must listen through the worries of life and the distraction of the world’s noise to hear and respond to his call. During the preparation for “my first communion” in the Catholic Church, I started to feel the Lord’s call toward service. I was 12 and lived with my parents by the Andes Mountains thirty miles north of Bogota, Colombia. I remember that I had some questions about Jesus and the Catholic Church. I asked questions like, “Why did baby Jesus not grow up?” “Why did we have to pay for baptisms, confirmations and funerals?” and “Why was preaching not relevant for real life?” I knew, somehow, that something was not right, but I did not know what. When I was 19, my parents sent me to Bogota to study. After a semester of living in a big city, my father and I got involved in a witchcraft situation without knowing it. We went to different places for help, but we could not find any release. We could not become free from that evil power. My uncle, who was Christian, told us that the only way to overcome that evil power was through Jesus Christ. Therefore, we decided to accept Jesus as our Lord and Savior, and we started to attend a Mennonite church in Bogota. After several months of attending, we were free from that evil influence. After a year, I was baptized by water. 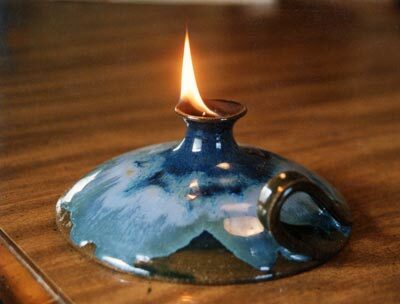 I remember that after my baptism, I began to pray for the baptism of the Holy Spirit. I prayed for a long time, believing Luke 11:13b: “. . . how much more will the heavenly Father give the Holy Spirit to those who ask him!” (NRSV) After three years of prayer, I was baptized in the Spirit in a worship service. Years later, I studied in Bogota in a two-year evangelical Bible institute. After that, the Lord granted me a one-year opportunity through the Mennonite Central Committee International Exchange Program in the US. Reflecting back on that time, I realized that the Lord was opening doors for me in different places. It was during that time, as I walked through those doors in obedience to God, that my ministry began to take shape. It was also during that time in 1993 that I decided to open my life completely to God and to serve the Lord only. I quit my job and said, “Lord, here is my life, use me as you wish.” God started to open doors outside Colombia for my Biblical and theological formation. 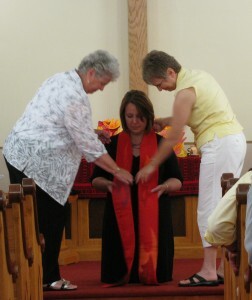 I went to Hesston College’s Pastoral Ministry Program. 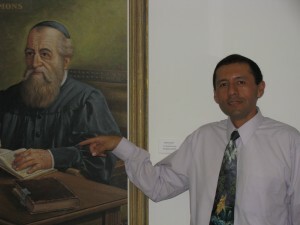 Years later, I went to Costa Rica to study the scriptures from the Latin American perspective. I thought Colombia was going to be the place for a long-term ministry, working with the poor and the victims of the country’s internal conflict, however the Lord had other plans for me. 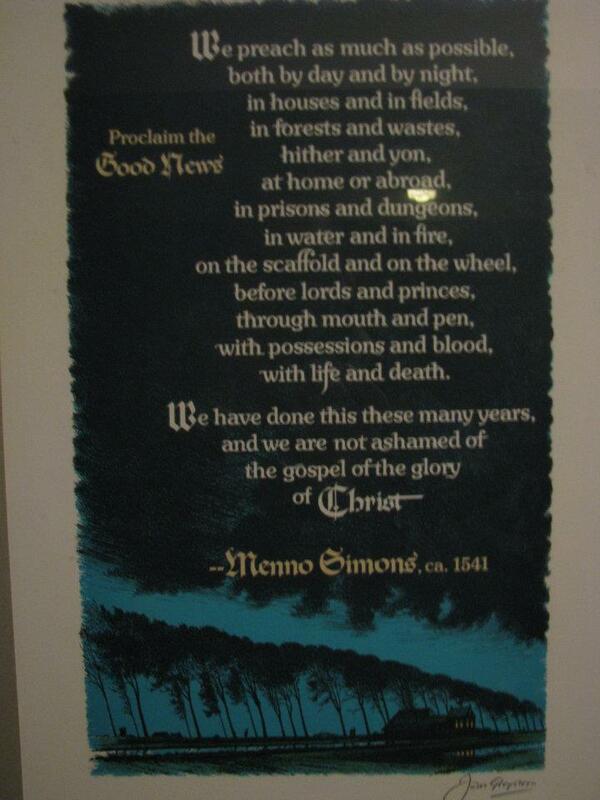 In 2006, God, in his mercy, allowed me to come to Eastern Mennonite Seminary for further education. Maybe God took me out of my country in order to serve somewhere else and not become one of the hundreds of pastors killed recently in Colombia. God’s call in my life has been a process: accepting Jesus as my Lord and Savior, witnessing God’s power against the powers of darkness, experiencing baptism in the Holy Spirit, responding in obedience, receiving an excellent Christian education and committing to serve in the Mennonite Church. New Hope Fellowship Baltimore is a new church plant connected with Wilkins Avenue Mennonite Church and New Hope Fellowship in Alexandria, VA. If you are interested in supporting this initiative to reach Spanish speakers in the city, contact Steve Kriss, skriss@franconiaconference.org. Can a conference be Church? What about a denomination? Can one person start Church? Can Church be one person? What is Church anyway? Am I a part of Church? How do I even start to define it? The first encounter I had with Church this summer was at a Fund for Theological Education Conference in New Orleans. I spent five days with other undergraduate and graduate students talking about the role of Church in our lives and how it will continue to shape our futures. During a tour of the city, we visited First Grace Methodist Church, a post-Katrina congregation born in the merging of a historically black congregation with a historically white congregation. One of our guides suggested that Church is like gumbo. She described this gumbo-Church as a bunch of stuff all thrown together that makes something wonderful—butyou don’t really want to know what’s in it. Church can feel like that sometimes. Pittsburgh convention this July offered another view of Church, this time within the denominational structure of Mennonite Church USA. People joined together from across the country to define where the denomination now finds itself. There were discussions, conversation rooms, and delegate sessions full of people sharing their stories. Many of these stories included pain. People and institutions can habitually and unintentionally harm those around them. 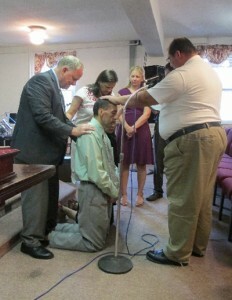 After convention, I traveled to Baltimore to visit Nueva Esperanza Baltimore, a Spanish-speaking church plant. The neighborhood of the church plant was desolate; it didn’t take much effort to spot a drug deal, a fist fight, or a prostitute—all in the middle of the day. Ubaldo Rodriguez, Nueva Esperanza’s pastor, hopes to build something from that desolation. But when does it become more than a pastor trying to build a congregation? When does it become Church? I also traveled with a group to Mexico City to build relationships with Church. The Bible School we helped with was an outreach that impacted the neighborhood. Alicia Alvarez and Ariel Avila, our hosts, had hearts for God and an incredible work ethic. But Fraternidad Christiana Prensa, their congregation, is in the midst of conflict. The long-time families of the church find themselves on opposing sides of many different issues and unable to agree. Last Sunday evening I was driving home with my roommate, Ardi. When I told him I was writing a blog post about Church, he chimed in. Cutting through all my questions, an unanticipated comment provides an answer. What is Church? These moments are Church. Church is something beautiful, something beautiful that lives.